Starting on Jan. 1, 2019, grocery stores and convenience stores in Colorado will be able to sell full-strength beer. DENVER — With full-strength beer on tap for Colorado grocery stores next week, some mom and pop liquor stores are a bit nervous about what it will do to sales. “Of course, I’m worried,” said Pat Bataa at Geno’s Liquors in Denver’s Highlands neighborhood. On Tuesday, Jan. 1, 2019, beer that is 3.2 percent alcohol by volume will be history in Colorado. Grocers and convenience stores will finally be allowed to carry full octane libations. "Our craft beer sales are going to be fine, but big companies — Coors, Budweiser, big cases — we're going to lose that for sure," Bataa said. Many can't wait to uncork the new law. "I'm here at the grocery store all the time, so having this here is great," said one Safeway customer. 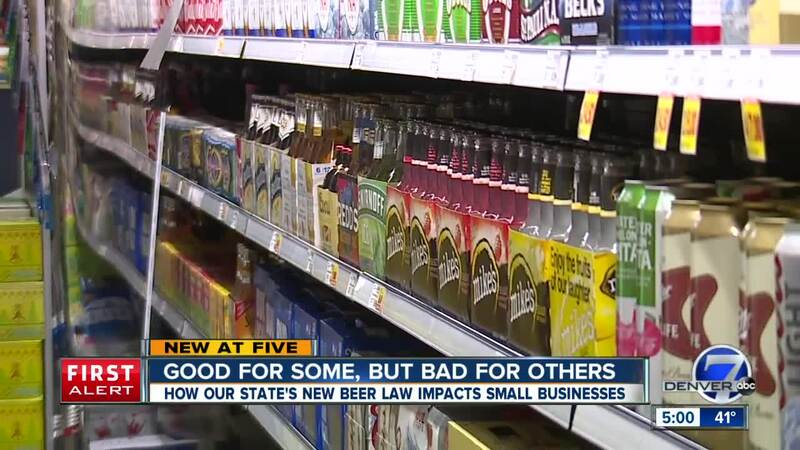 But mom and pop liquor stores are hoping their beer sales don’t fall flat. "Every single grocery and convenience store, suddenly overnight, will be able to sell full strength," said Lisa Von Feldt, owner of The Wine Seller and Spirits, Too in Denver. "I feel like we're going to lose our customers," Bataa said. “Short-term, we're going to lose like 20 percent of our sales. In three months, we'll know for certain." Keep in mind, the new law will not change where you can buy wine and liquor. Only licensed liquor stores will be allowed to sell those items.